The University of New Brunswick is alive again as another school year begins and new and returning students descend upon the university's campuses. Here are some of the highlights of Orientation 2018. The UNB Fredericton campus gathers each fall to officially induct new students into academia. 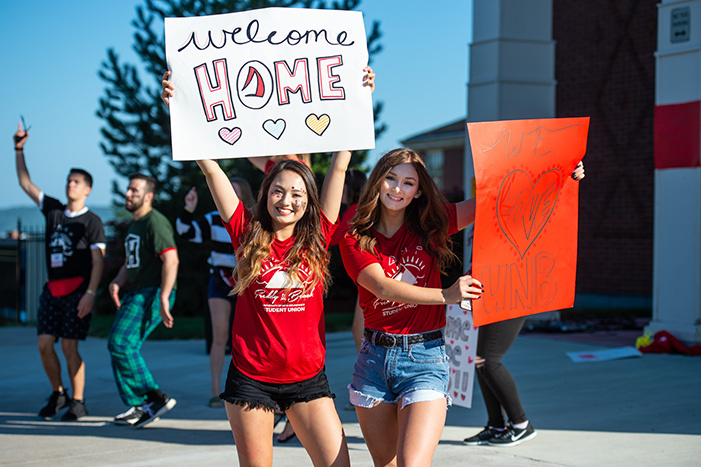 Hosted by President Eddy Campbell, this special ceremony gives the whole campus community the chance to welcome new students to the UNB family. Join in as the whole city welcomes new students to Fredericton. Students and the public can enjoy the night market, the Beaverbrook Art Gallery, the walking bridge, live music and much more. All UNB, STU, NBCC and NBCCD students are invited to join in traditional dancing, drumming, chanting and more. The Fire Department will be hosting a Dorm Burn. Watch two mock dorm rooms go up in flames to spread awareness of fire safety. Join us for a free BBQ! Shinerama has been a University of New Brunswick tradition since 1973. For the last 45 years, students at UNB have raised money to support cystic fibrosis research in Canada. Shiners have raised nearly $25 million by shining shoes, flipping burgers, washing cars and doing whatever it takes to raise crucial funding to fight cystic fibrosis. Shinerama is now Canada's largest post-secondary school fundraiser with 35,000 students in more than 60 university and college campuses taking part across the country. Last year we collectively raised more than $1 million. A yearly event at UNB Saint John, Shine Day sees first-year students spread across uptown Saint John raising funds for and generating awareness about cystic fibrosis. Approximately 35,000 students at more than 60 universities and colleges across Canada participate in Shinerama, making it Canada's largest post-secondary school fundraiser.